What is the biggest obstacle when it comes to system enhancements? Some say cost, others may say time. What about the commitment? Then there’s the whole fear of change in general. As end users ourselves, we understand these valid concerns. 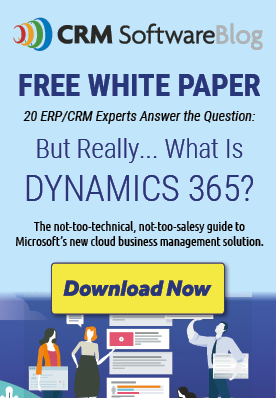 That’s why we’ve addressed all of these challenges when launching our latest product developments for Microsoft Dynamics 365 for Sales (CRM). Whether your business is in need of a time-saving fix to your monotonous billing process or you’re looking for an easier way to process taxes directly in D365, we’ve got the solution for you. These three apps: Recurring Billing, Software Management, and Tax Processing, are designed to make your everyday business processes simpler and easier. Cost: FREE. For a limited time only, we’re offering an extended six month FREE trial for each of these applications. Time: The install and configuration of these apps is the epitome of quick and easy. Within a matter of minutes, the app will be installed into your system and you’ll be ready for setup. Commitment: No contract, no fine print, no strings attached. After the six month free trial expires, you’ll be billed every month on a subscription basis. Change: Yes, these applications will change your daily routine, but, we promise it will be for the better! We’re talking about saving over 15 hours a month spent on invoicing related tasks and increasing your receivables by over 25% by collecting on-time payments and/or in the form of penalties. We’ve made it quick and easy to take advantage of this six month free trial offer. Simply download the app from the Microsoft AppSource if you’re in an online environment, or request the installer package if you’re on-premise. After our sales team receives a few pieces of information, such as your organization name a reliable contact person, we’ll issue your company a 6-month registration key. There is no payment information required and no strings attached! All that’s left to do is configure your solution using our self-service implementation and hit the ground running! Instant gratification is just a click away! Why wait? Start saving your team time and money and get started with one of our free six-month trials today!